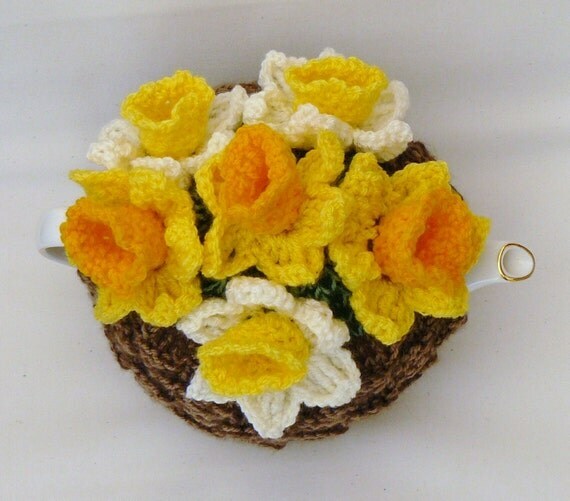 his pretty tea cosy is sure to brighten your day! Daffodils are one of my favourite flowers - their sunny yellow faces always make me smile.. This tea cosy has been handknitted using double thickness yarn. The bottom section is knitted in a basket stitch using a strand of mid brown together with a darker brown - to create a 'basket' effect. The upper section is knitted in green, again using 2 toning strands. The basket is decorated with 6 daffodils. The tea cosy will fit most medium to large teapots. It is also washable - either by hand or in the machine (on a delicate wash, maximum 30 degrees). Supplied gift wrapped in tissue paper. Handmade with love in my smoke free and pet free home. Folksy :: Buy "Spring Pink Flower Large Crochet Doily"
Folksy :: Buy "Quirky Hat"
Folksy :: Buy "Multi-Coloured Curly Crochet Scarf"
Folksy :: Buy "Damask Spring Daffodil"
Folksy :: Buy "Large Crochet Granny square brown blanket/ throw NEW 60" sq"